In a large blender add 1 cup ripped mango along with ½ cup thick cold milk. Add 3 scoops of vanilla ice cream or mango ice cream. Now add 2 tsp sugar and blend. Blend smooth to form a thick milk shake. keep aside. in a large glass, firstly add few pieces of mangoes. Now, pour prepared mango milk shake, leave space at the top for ice cream scoop and nuts. Now top with few more chopped mangoes. Garnish with chopped cashews, almonds and pistachios. Also add some tutti frutti. 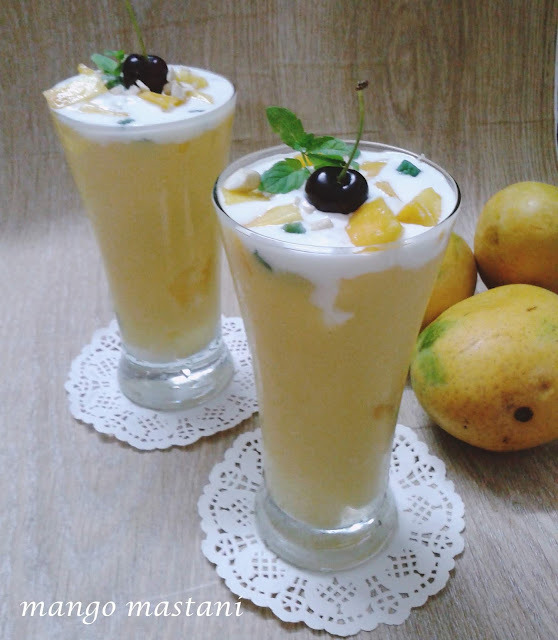 Serve mango mastani chilled with a spoon and straw.